Are you looking for an affordable, accredited LPN-RN program close to home while having an opportunity to continue to work? Look no further! HRMC and Southeast Technical Institute have partnered to offer an associate LPN-RN degree right here in Huron. Visit Southeast Tech's website for more information. Scholarships are available! *All five required classes can be taken online or from any accredited institution. HRMC is hiring and granting scholarships for LPNs committed to working at HRMC. View scholarship information. 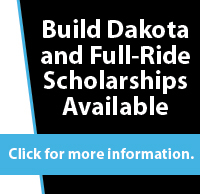 The Build Dakota Scholarship Fund was created to give students an incentive to pursue a degree in a high-need technical field for the exchange of their commitment to work in South Dakota for three years. Students must work as an RN in South Dakota for 3 years. Students accepted into the Huron LPN to RN program are eligible to receive a full-ride scholarship, which includes a Build Dakota scholarship along with funds from a sponsoring local healthcare facility. HRMC Foundation is working to find industry partners to sponsor the remaining 50 percent of all tuition and fees for the program, for the commitment of working at the sponsoring facility for three (3) years. Students interested in this associate nursing degree should first apply and be accepted to the LPN to RN program, and then apply for a Build Dakota scholarship by March 29, 2019. It is important to start the application process as soon as possible to ensure completion of all pre-entrance requirements. For questions, students can call Brooke Sydow, EdD, HRMC Workforce Program Developer, at 605-353-6323 or visit Southeast Tech's website at southeasttech.edu/huronlpntorn.